To increase font-size in Xcode is a pain. I'll modify a previous post for the current version. In the source editor box there is a list of types of text that you may set the font for: Plain text Comments Documentation Comments . . . In the 'Font' window, click the small, almost hidden, and surely poorly design 'T' icon to the right of the font name and size. Voila! In only 14 keystrokes you are able to get the Font inspector window! Close the windows you opened on this hunt for the holy grail. Congratulations. Your may now read your code. Wasn't that painless? Make sure to press CMD+A to select all possible text types. Then change the font size from the picker. Update! - Behold Xcode 9 to the rescue! Now you can use cmd + to increase the fonts with Xcode 9. It took 5 Major releases for you to get it, Apple! But better late than never. figured it out - however it was not very intuitive. When You try to change the font size directly using edit -> format -> font, nothing happens! - Not a good UX ... moreover why play dumb when you can tell user that they are using default or "System-owned" theme and they cannot change it? - Bad Design and more bad UX ... Why keep this option (Cmd t) alive, which by the way is most standard way to increase font size across most well behaved mac apps, if you do not want user to change the font this way? In Xcode preferences, when you try to change the font size by clicking on "fonts and colors", thats when XCode gives a pop-up saying what needs to be done. Also making a duplicate and then changing the fonts and colors is a lot of work rather than giving a button that says "Restore to Defaults" if Apple is so worried about the user messing up the default settings! The solution is that - you need to duplicate the theme and then modify the copy you just made and apply that copy - phew! Watch out because there's no undo! 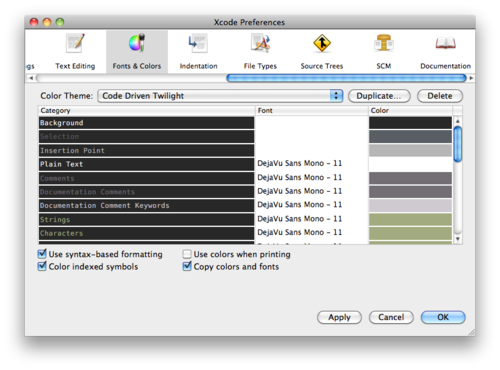 Go to Xcode -> preference -> fonts and color, then pick the presentation one. The font will be enlarged automatically. Double-click on Plain Text, a popup menu will come up. Change it from there. When changing fonts in XCode from [Preferences] (after duplicating a template that matches colours close to what you want), you can select multiple entries and change the fonts all at once. Use [shift] to select a range or [cmd] to select multiple individual entries (e.g. you might select both 'comments' and 'strings' and change only their fonts). I also found that you can change the fonts for printing which is controlled by the "Printing" theme. I wanted the print output to be the same as the default, but with a larger font. rename "printing" to "printing1" (select the printing theme and click on it and it should allow you to change the name). After this the printouts should match the new "Printing" template (i.e. in color and bigger, or however you make the template), the key is that printing takes its formating from the "Printing" Theme. 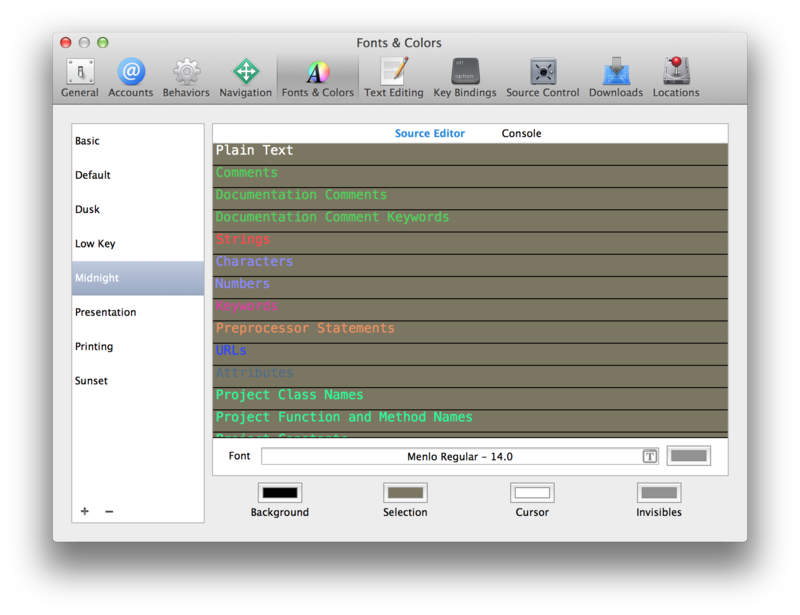 Go to Xcode -> Preferences... -> Font & Colors -> 'select all types of font in' Default tab. On this Selection apply Font Size from bottom control. As suggested by other respondents I suggest that you copy your preferred theme before you tweak the fonts for there is no ease way to undo. In my case, all I wanted to do was increase the font size. Mercifully you can select multiple items (Shift+select or Cmd+select) and set the font for all the ones selected in one fell swoop. Minor relief for a major irritation. Not the answer you're looking for? Browse other questions tagged xcode font-size or ask your own question. Which MacBook can comfortably display XCode for iPhone development? How to set font size to 16 in Xcode? Where do I find the line number in the Xcode editor?